I want to find the fastest method of getting the range object which contains all values in a worksheet, while only containing 1 area. Traditionally one might think this is what UsedRange does, however UsedRange often selects cells outside of the value range. 'Loop over all areas selected by special cells. Clearly the 2nd version I made is far superior than the version which exploits SpecialCells() however I was wondering whether anyone else had any other ideas to speed up the algorithm further? In terms of speeding up your 2nd option. The following code changes should work. NOTICE that I put in a decrement counter in each loop. this should half the loops' run time. This should work. It's pretty simple method. I cannot test with your sheet as mine is not nearly that large, but you can try it. IMPORTANT NOTE: This MUST be called as a Sub if it is a function that is called from a cell then, it will not work. (because excel uses the active range to perform the start of the SpecialCells I believe). I have tested this code with your picture of cells and it works well. It also works with other versions of cell combinations and locations that I have tested. The reason to use the following code is because it is simple and can save valuable programming time. The SpecialCells Method is reliable if used correctly just like any other programming language and function. It is worth a try and also worth timing with your larger data. In addition, the OP also uses SpecialCells in his code, just not the same way that I have. The fastest method so far is listed as ValueRange and is a modification of which came from being inspired by code posted by IAmNerd2000. In this post I'd like to cover the 2 best solutions discussed. 'V2 - Initial version using arrays by Sancarn. 'V3 - IAmNerd2000: Store ubound, lbound to prevent recalculation after compilation. 'If out of memory, fall back on VBasic2000's version. It's not optimal but it doesn't have memory issues! Edit: IAmNerd2000's original approach fails when formatting lies outside the "RealUsedRange". Thus it was removed from this post. Edit: As MacroMarc pointed out, very large used ranges will cause the optimal code to crash due to an Out of memory error. As a current work around I resort to VBasic2008's code if the error occurs. So at worse it will be as slow as VBasic2008's code, but at best it will be 10x faster. Edit: RealUsedRange_VBasic2008_refac didn't work in some situations. The solution has now been changed to reflect this.
' Purpose:    Returns the used range of a worksheet. Debug.Print "The Real Used Range address is [" & URng.Address & "]"
MsgBox "Worksheet '" & cSheet & "' is empty." Other 'fractions' of the Real Used Range using the Find Method. By the way, as the UsedRange property has failed you so will the SpecialCells method rather sooner than later since they are somehow connected. See example. Expression is a range object, in our case it will be .Cells which refers to all cells in the worksheet. You can use them in Argument:Parameter style or enter them by adding their parameters in the exact order (separated by commas) which will be used here. The What argument is understandable by itself: search for anything "*". The MatchCase argument is by default False (Caution: it is not by default False for the Replace method though). The arguments MatchByte and SearchFormat are beyond the scope of this case and will not be further investigated, which leaves us with arguments number 2 to 6. 2. After has to be a one-cell range contained in expression (Initial Search Range). Note that this cell will be searched last, so if you use .Cells(1, 1) or .Cells(1) the search will start with the next cell e.g. .Cells(1, 2), .Cells(2, 1)... or .Cells(2), or the previous cell e.g. .Cells(1,.Columns.Count), .Cells(.Rows.Count,1) or .Cells(.Cells.Count) depending on the SearchOrder and SearchDirection parameters. The default value is .Cells(1, 1) or .Cells(1), which can be omitted when used. To calculate the Last Used Row, Last Used Column or Last Used Cell this parameter will be omitted (.Cells(1)) because we want to start searching from the last cell going up or to the left. 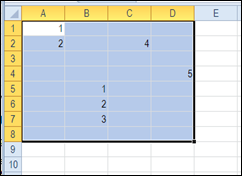 To calculate the First Used Row, First Used Column or First Used Cell this parameter will be .Cells(.Rows.Count, .Columns.Count) or .Cells(.Cells.Count) because we want to start searching from the first cell going down or to the right. - xlValues or -4163 will find any cell with a value except a cell containing a formula that evaluates to "". - xlFormulas or -4123 will find any cells with a value including cells containing a formula that evalutates to "". This parameter will be used because we cannot ignore cells containing a formula that evaluates to "". - xlComments or -4144 will find any cell containing a comment (not used in this case). xlWhole or 1 searches for whole strings only i.e. to find a cell containing e.g. Word, it will find a cell containing Word, but will not find a cell containing WordId. xlPart or 2 searches for parts of the string i.e. to find a cell containing e.g. Word it will find cells containing both, Word or WordId. From everything I've read it is unclear using which parameter would make our search faster so it will be omitted in our case. Should be further investigated. xlByRows or 1 will perform the search by rows e.g. in a Next search from the last cell it will search in A1, B1, C1...A2, B2, C2...(.Rows.Count, .Columns.Count). xlByColumns or 2 will perform the search by columns e.g. in a Next search from the last cell it will search in A1, A2, A3...B1, B2, B3...(.Rows.Count, .Columns.Count). The settings for LookIn, LookAt, SearchOrder, and MatchByte are saved each time you use this method. If you don’t specify values for these arguments the next time you call the method, the saved values are used. Setting these arguments changes the settings in the Find dialog box, and changing the settings in the Find dialog box changes the saved values that are used if you omit the arguments. To avoid problems, set these arguments explicitly each time you use this method. There is the What argument, there are 2 arguments (After, SearchDirection) with possible default values and 3 arguments (LookIn, LookAt, SearchOrder) that are saved each time. Not the answer you're looking for? Browse other questions tagged excel vba or ask your own question.